What are neurotransmitters? They are "chemical messengers." The “messages” conveyed by neurons are biochemical and bioelectrical. 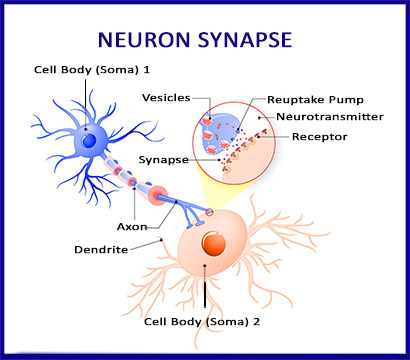 A neurotransmitter is “biochemical.” After it crosses a synapse and makes contact with a receptor site on another neuron, the “chemical” enters another cell. When that “biochemical process” reaches the axon of a nerve, the information becomes an electrical signal, which travels down the neuron. 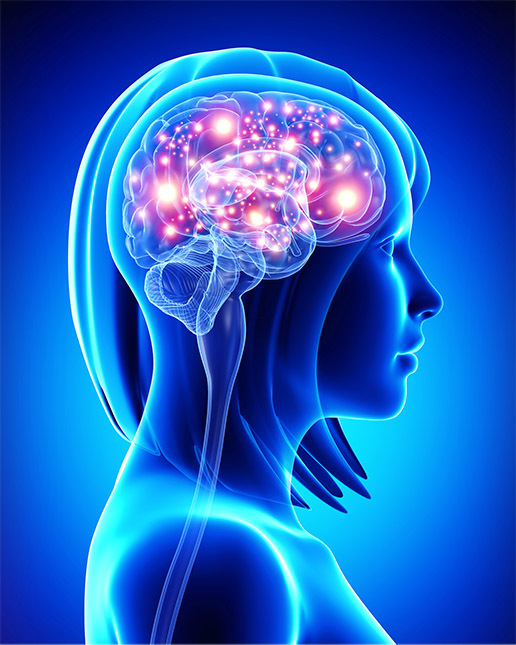 Neurotransmitters communicate information throughout the BrainMind and the MindBody. Every neurotransmitter except for acetylcholine is made from amino acids. Without amino acids there would be no neurotransmitters. Without neurotransmitters we could not exist for one moment. In my experience most Americans have neurotransmitter deficiencies or excesses. Amino acid therapy makes sense as a logical way to balance neurotransmitters. The main neurotransmitters are norepinephrine, serotonin, dopamine, endorphin, acetylcholine, GABA, glycine, glutamic acid, aspartic acid, and taurine. The first three neurotransmitters in this list are made “from” amino acids. The last four “are” amino acids. There are also hundreds of less common neurotransmitters called “neuropeptides.” Neuropeptides are short chains of amino acids. Treatment of mental distress, whether with medications or natural treatments, has focused on neurotransmitters. Rarely are recommendations made based on any lab work. When an electrical nerve impulse reaches the end of a nerve fiber, a neurotransmitter, a natural substance, is released from one nerve ending into a synapse, the space between two neurons. Let’s say we are talking about the neurotransmitter “norepinephrine.” The amino acid L-tyrosine, stored in vesicles of nerve endings, with the help of P-5-P (pyridoxal-5-phosphate), is converted into norepinephrine which then enters a synapse. When norepinephrine makes contact with a receptor site on the “other side” of another neuron, an “information signal” is communicated to one or more neurons (or to muscle). Tyrosine hydroxylase is the enzyme that converts L-tyrosine into L-dopa. This enzyme requires ferrous iron and THFA (tetrahydrofolic acid) in order to convert L-tyrosine into L-Dopa. L-dopa gets converted into dopamine through the action of the enzyme dopa decarboxylase. This enzyme requires the nutrient P-5-P (pyridoxal-5-phosphate), the active form of vitamin B-6 to convert L-dopa into dopamine. The enzyme that converts dopamine into norepinephrine requires the nutrients copper and ascorbic acid (vitamin C). The enzyme that converts norepinephrine into epinephrine, N-methyltransferase, requires the nutrient SAMe (S-adenosylmethionine). Here is the essence to remember: 1) Amino acids are the nutrients that turn into neurotransmitters, 2) An enzyme is required for every step in this process, and 3) Every enzyme requires certain nutrient co-factors in order to function. When I am looking at lab work, analyzing amino acids and neurotransmitters, there are times where I’m not sure why a neurotransmitter might be too high or too low. That is when I will think about the enzymes involved. SAMe, the nutrient required to convert norepinephrine into epinephrine, is part of the methylation pathway. There is a growing epidemic of people with a methylation defect, and these people can have neurotransmitter abnormalities caused by a methylation problem interfering with the activity of an important enzyme. 70-75% of people with CFS/ME have problems with methylation. If this problem progresses, that person will have trouble making glutathione, and will become more and more chemically sensitive. A person can become so sensitive that they react negatively to nutrients they must have. People with a methylation pathway blockade may not be able to convert norepinephrine into epinephrine, leading to an excess of norepinephrine and a deficiency in epinephrine. We can test for neurotransmitter precursors (amino acids) and we can test for neurotransmitters directly. Most of the time amino acid therapy is sufficient to balance neurotransmitters, but we have to understand that the enzymes that convert each step must have certain nutrients. If those nutrients are deficient, those enzymes won’t work very well, and the conversions from one neurotransmitter to another will be inadequate. If someone has a methylation problem, treating that problem will be as important as supplying the key neurotransmitter precursors. WHAT SUBSTANCES MAKE UP THE BRAIN? While the focus on the treatment and understanding of the brain has mainly involved the role of neurons and their neurotransmitters, the story is more complex. 75% of the brain is water. If we subtract water from the equation, the brain is about 60% fat. There are about 100 billion neurons in the brain, but 10 to 50 times more glial cells. 1. Supplying nutrients and oxygen to neurons. 2. Surrounding neurons and holding them in place. 3. Insulating one neuron from another. 4. Destroying pathogens and removing dead neurons. Our understanding of physiology is as good as our current models of technology. In the computer age we can think of the role of nerves, synapses, and neurotransmitters as our “software.” The rest of the brain is our “hardware,” and up until quite recently our hardware has been thought of as a “fixed item,” like the available hard drive (ROM) on your computer. We are not yet at a point to test for and treat anything other than neurons, but it is highly likely that the future of psychiatry and neurology will include the role that water, special kinds of fat, and glial cells play. Treatment of mental distress, whether with medications or natural treatments, has focused on neurotransmitters. Rarely are recommendations made based on any lab work. Now that you have a good idea about neurotransmitters, let's take a second to look at where this biochemistry is taking place, namely the neuron synapse. Cell body - contains the nucleus. Axon - the long extension that carries nerve impulses away from the cell body. Axon Terminals - the hair-like ends of each axon. Dendrites - the branch-like structure of a neuron that receives messages from another neuron's axon terminal. Synapse — the space between 2 nerves, or between one axon terminal and one dendrite. Myelin sheath - the fatty substance, made of phospholipids, that surrounds axons. In order to understand how nerves communicate with each other, almost all of our attention needs to be focused on the synapse. Here's how that communication takes place. An electrical impulse shoots down the axon of Neuron 1. In the axon terminals are nutrients that get converted into neurotransmitters. For example, the amino acid, L-tyrosine, is present in billions of axon terminals. Using L-tyrosine as an example, here is what happens. When the electrical charge reaches L-tyrosine in the axon terminal, the L-tyrosine is converted into norepinephrine, which then moves into the synapse, the space between two nerves. Excessive amounts of neurotransmitters will be taken back up by the re-uptake pump on the axon terminal of Neuron 1. Norepinephrine floats into the synapse, and much of it will reach the dendrite of the next cell, setting off chemical reactions within Nerve Cell Body 2- That chemical reaction turns into an electrical reaction when it reaches the axon of Neuron 2, leading to the same sequence of events that just took place in Neuron 1. It is important to understand that the way neurons communicate with each other is biochemical…and bioelectrical. ​Now that you have a "visual" idea of neurons and synapses, let's take that knowledge and start to apply it to the reasons why you are probably visiting this web site. Click on the DEPRESSION link above to see what these neurotransmitters are doing and we how we test for them.